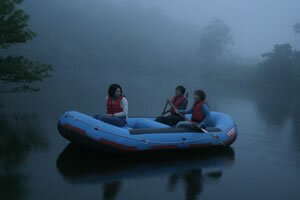 Madarao Kogen is located in the heart of the Shin-Etsu highlands nature reserve. 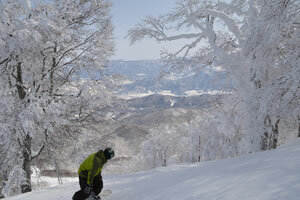 There are 38 hot springs (onsen) across the 10 plateaus and plentiful snowfall for 32 local ski resort areas. Mother Nature delivers her wellness to Madarao Kogen with the beauty of winter and the joy of skiing, snowboarding and snow play. The local Chikuma River, which is part of the longest river in Japan, has carried abundant water and nurtured the fertile land and climate for thousands of years. 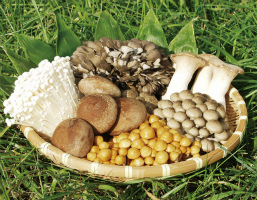 Today people in the area enjoy the greatest longevity in the world helped by the wealth and variety of vegetable such as mushrooms, fruits and rice that can harvested. 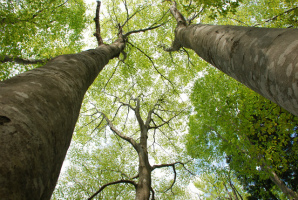 The Shin-Etsu highlands nature reserve has become a utopia that is able to heal people from over the world. Come stay with us at Pension Ringo Jam allowing your body, mind and soul to completely rest and recharge! 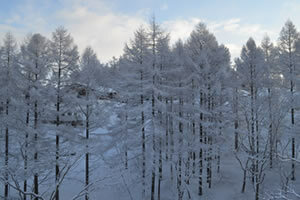 Welcome to Madarao Kogen! 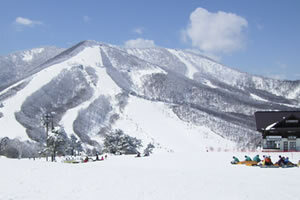 Madarao Kogen is a high altitude ski resort over 1,000m with a significant amount of powder snow falling in winter. There are eight ungroomed tree skiing courses with fresh deep snow and 16 groomed courses. 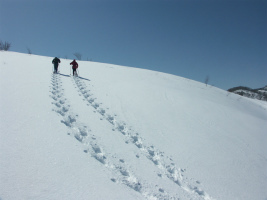 Some of the courses are easy enough for novice skiers to improve their skiing skills quickly, intermediate skiers can gain more advanced techniques and remarkable progress can be seen for and enjoyed by advanced skiers. Kids play land, babysitting services, a snow play area and a ski school for children are available at Madarao Kogen ski area, making it a great resort to enjoy a family ski trip. 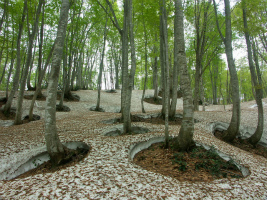 In the Spring fresh green buds of beech forest and oak advance toward Mount Madarao from the foot of the mountain as the snow melts in the forest. The chorus of birds you will hear as you enter the forest is like a music CD to savour and contemplate. Edible wild plants such as the butterbur begin sprouting in and around Madarao Kogen. 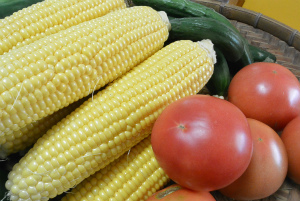 Trips to pick wild vegetables in the mountains continue at Pension Ringo Jam until mid-June. The dawn of Spring begins with a sea of ​​clouds. The sky and the mountains dominate the east side of Shin-Etsu Plateau with monotone views of blue gray spreading up to Mount Madarao. A pale orange light soon moves across the mountain and produces light of intense diamond dust spreading quickly. Soaring high above the city of Iiyama below, there is a glorious view across a white sea of ​​clouds. The changing orange sunlight shines in this drifting sea of ​​clouds while hitting the waves. The scene every morning glows differently day to day and provides a glorious start for visitors to Madarao. Because Madarao Kogen is in the Shin-Etsu highlands at an altitude of 1000 metres the average temperature in summer is a mild 21 degrees. Flowers bloom from around May to June and we enjoy gardening until the delightful autumn starts to take hold. 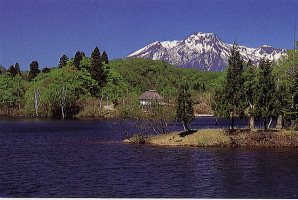 The area is also an origin of the delicious Nagano apple. From the end of October until the end of November Shin-Etsu highlands is dyed in beautiful colours of red and gold. It is also the season of for harvesting the delicious local variety of buckwheat. Come to Madarao to walk amongst the beautiful autumn leaves, see the colorful foliage and enjoy the taste of new seasonal buckwheat noodle or eating the local snack - Oyaki buns! Copyright © 2014 Pension Ringo Jam All Rights Reserved.